Freestyle is without doubt the most versatile of disciplines, providing action close to that of extreme Wave Performance, but in a wider variety of conditions. 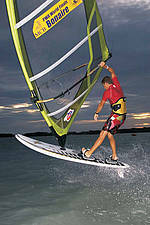 Freestyle was first brought to the international stage by the PWA in 1998 as a means to bring a wider range of windsurfing options to those who live inland or in flat water locations. Freestyle is the youth blood of windsurfing and has been responsible for much of the new talent that has come into the sport in recent years. The flexibility and youthful vibrancy of Freestyle, makes it a great lifestyle discipline that works brilliantly at large scale public contests, with stage managed performances and a rock 'n' roll atmosphere. Equally at home in the windswept waters of Gran Canaria, to the tranquil lakes of central Italy and the beaches of the Caribbean, Freestyle is the true all rounder and never fails to deliver on its promise of unpredictable fun and a truly animated show.